Appalachian Split Rail posts are made from a mixed hard pine, dried and treated for in ground use and are available in two or three rail fence systems. 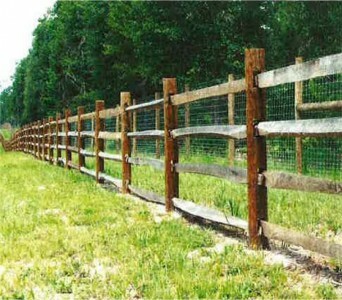 A four rail fence post is also available on a special order basis. The Appalachian Split Rail post utilizes a half round post with about a six inch face and generally has a fairly smooth and finished look. These posts have rectangular holes for the rails which also sets it apart from the more traditional Classic Split Rail style. 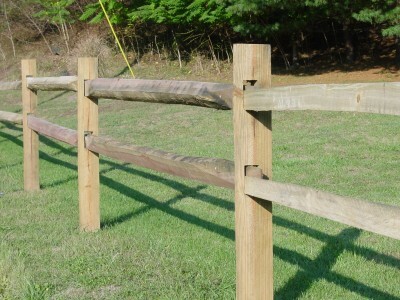 Appalachian Split Rail post rail spacing starts 6 inches from the top and then holes are spaced every 15 inches. Both styles use the same sawn and paddled rail that is pressure treated to protect it from decay and termite damage. Our end posts are cut over size, especially designed to handle a typical metal farm gate. Rails used in both the Appalachian and Classic styles are manufactured from either high quality Poplar or Pine logs. Each rail is sawn, hand graded and the ends are paddled to produce a quality fence rail that will give many years of durable service. Rails are 11 feet long and have an average center diameter of 14 inches. All of our rails are pressure treated with a wood preservative to the above ground use specifications adding to the years of dependable service life. Installation – A typical fence section of either the Appalachian or Classic style of Split Rail Fence is 10 linear feet. It is always best to start in a corner or end with holes 24 to 30 inches deep every 10 feet interlocking the rails with the posts as you progress down the fence line. Back filling with gravel is preferred to concrete.